This exquisite memory foam mattress cradles you in deep comfort layers, forming to the exact shape of your body for proper spinal alignment and maximum pressure relief. The elegant box top design delivers extra cushioning at the surface for an ultra soft, pillowy feel. The mattress cover is made from Viscose, a wood cellulose fiber known for its softness and breathability. A layer of bamboo-infused memory foam is quilted to the cover for extra cooling power at the surface, keeping you at a comfortable sleep temperature all night long. A base layer of poly foam delivers the sturdy body support you need. Made from natural, renewable, and toxin-free materials, this luxurious memory foam mattress is a safe, healthy, and environmentally-friendly addition to your home. 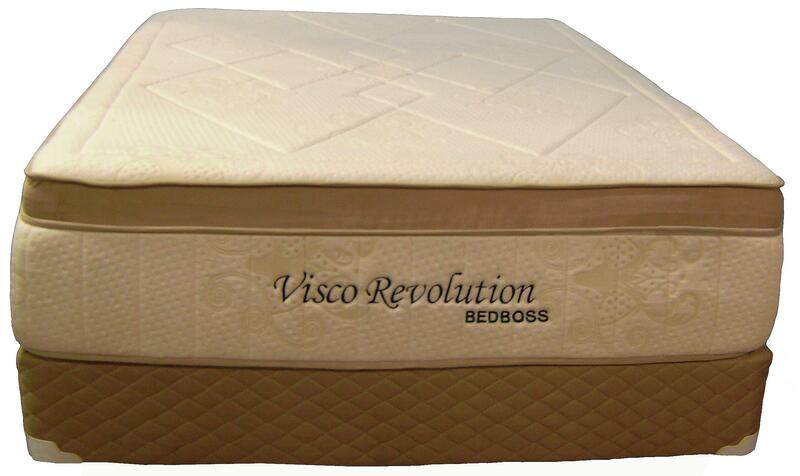 The Visco Revolution King Box Top Memory Foam Mattress and Foundation by Bed Boss from Nashco Furniture - Nashville. We proudly serve the Nashville, Franklin, Brentwood, Clarksville, Green Hills, Davidson County, Williamson County, Tennessee area. Product availability may vary. Contact us for the most current availability on this product. 15K King Memory Foam Mattress 1 15"
Top Luxurious Maximum Cool Viscose Cover with Premium Trim, Quilted with 1" Cooling Bamboo-Infused Memory Foam. Mattress Construction CertiPUR-US® approved: The polyurethane foam in this mattress has been tested by an independent laboratory to meet rigorous environmental, health, and safety standards. The Visco Revolution collection is a great option if you are looking for Mattresses in the Nashville, Franklin, Brentwood, Clarksville, Green Hills, Davidson County, Williamson County, Tennessee area. Browse other items in the Visco Revolution collection from Nashco Furniture - Nashville in the Nashville, Franklin, Brentwood, Clarksville, Green Hills, Davidson County, Williamson County, Tennessee area.